If you like exotic plants and enjoyed last week�s article about the cannas, here are the perfect companions to plant with them as they have almost identical care requirements: The callas! What now, you might think � is he trying to completely confuse us? The calla lily, although not a true lily, is one of the most beautiful flowers one can plant in a garden, as its exotic trumpet shaped flowers and light fragrances makes it feel as if one is in heaven on earth. A grouping of calla lilies is a wonderful addition to any garden and the flowers are an absolute favourite as a cut flower inside the house. Do not be afraid to cut the flowers � it will not harm the plant. 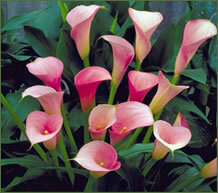 Calla lilies are very easy to grow and are quite hardy to any minor abuse that might occur. The calla lily, or Zantedeschia, is a genus of twenty-eight different species all native to the southern parts of Africa with a tropical climate. It became a major hit in Europe and is still very popular, especially as a wedding flower. The flower (technically a spathe or modified leaf) blooms from the top of a rather thick stem and sort of resembles trumpet shaped rolled paper. The common calla has white flowers and is the hardiest type. The coloured hybrids come in various shades of pink, purple, yellow, and orange and are a little more �sensitive�. They all have lush green leaves, often covered with lightercoloured spots. 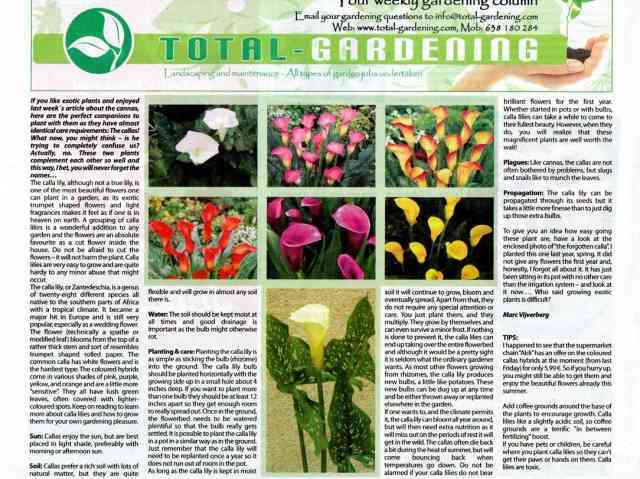 Keep on reading to learn more about calla lilies and how to grow them for your own gardening pleasure. 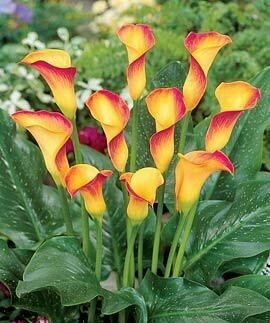 Sun: Callas enjoy the sun, but are best placed in light shade, preferably with morning or afternoon sun. Soil: Callas prefer a rich soil with lots of natural matter, but they are quite flexible and will grow in almost any soil there is. Water: The soil should be kept moist at all times and good drainage is important as the bulb might otherwise rot. Planting & care: Planting the calla lily is as simple as sticking the bulb (rhizome) into the ground. The calla lily bulb should be planted horizontally with the growing side up in a small hole about 4 inches deep. If you want to plant more than one bulb they should be at least 12 inches apart so they get enough room to really spread out. Once in the ground, the flowerbed needs to be watered plentiful so that the bulb really gets settled. It is possible to plant the calla lily in a pot in a similar way as in the ground. Just remember that the calla lily will need to be replanted once a year so it does not run out of room in the pot. As long as the calla lily is kept in moist soil it will continue to grow, bloom and eventually spread. Apart from that, they do not require any special attention or care. You just plant them, and they multiply. They grow by themselves and can even survive a minor frost. If nothing is done to prevent it, the calla lilies can end up taking over the entire flowerbed and although it would be a pretty sight it is seldom what the ordinary gardener wants. As most other flowers growing from rhizomes, the calla lily produces new bulbs, a little like potatoes. These new bulbs can be dug up at any time and be either thrown away or replanted elsewhere in the garden. If one wants to, and the climate permits it, the calla lily can bloom all year around, but will then need extra nutrition as it will miss out on the periods of rest it will get in the wild. 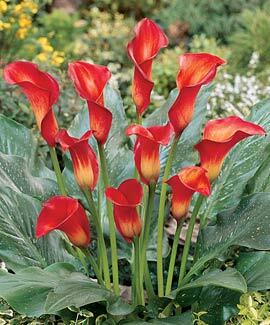 The callas often die back a bit during the heat of summer, but will come bouncing back when temperatures go down. Do not be alarmed if your calla lilies do not bear brilliant flowers for the first year. 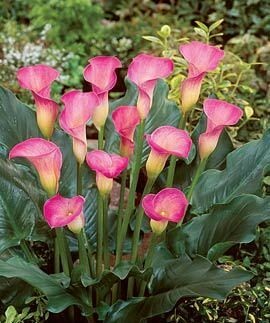 Whether started in pots or with bulbs, calla lilies can take a while to come to their fullest beauty. However, when they do, you will realize that these magnificent plants are well worth the wait! Plagues: Like cannas, the callas are not often bothered by problems, but slugs and snails like to munch the leaves. Propagation: The calla lily can be propagated through its seeds but it takes a little more finesse than to just dig up those extra bulbs. 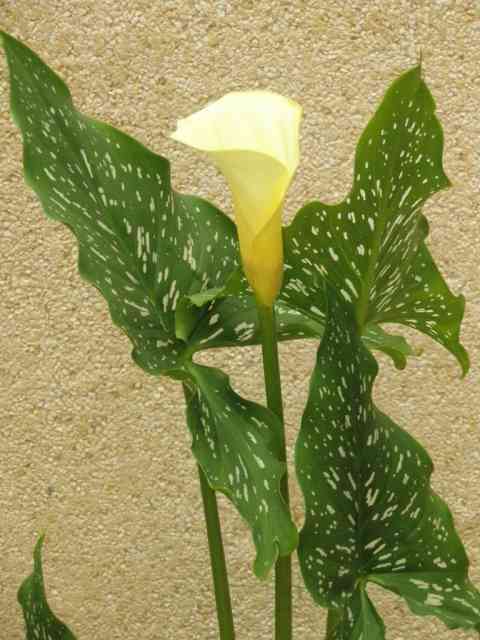 To give you an idea how easy going these plant are, have a look at the enclosed photo of �the forgotten calla�. I planted this one last year, spring. It did not give any flowers the first year and, honestly, I forgot all about it. It has just been sitting in its pot with no other care than the irrigation system � and look at it now�. Who said growing exotic plants is difficult? I happened to see that the supermarket chain �Aldi� has an offer on the coloured callas hybrids at the moment (from last Friday) for only 5.99 �. So if you hurry up, you might still be able to get them and enjoy the beautiful flowers already this summer. Add coffee grounds around the base of the plants to encourage growth. Calla lilies like a slightly acidic soil, so coffee grounds are a terrific "in between fertilizing" boost. If you have pets or children, be careful where you plant calla lilies so they can't get their paws or hands on them. Calla lilies are toxic.